A unique burden was inherited by the children of President John Fitzgerald Kennedy and his celebrated siblings, Senators Robert and Ted Kennedy. Raised in a world of enormous privilege against the backdrop of American history, the lives of this third generation of Kennedys often veered between towering accomplishment and devastating defeat. In his revelatory new book, acclaimed Kennedy historian J. Randy Taraborrelli draws back the curtain on the next generation of America’s most famous family. John Kennedy, Jr.’s life in the public eye is explored, following the Kennedy scion as he faced the challenges posed by marrying his great love, Carolyn Bessette. Riveting new details are shared about the couple’s tragic demise—and why Ethel Kennedy advised Carolyn not to take the trip that would ultimately end her life. John’s sister, Caroline Kennedy, had her own complicated relationships, including a marriage to Ed Schlossberg that surprised her mother, Jacqueline Kennedy Onassis, and an unexpected bond with her mother-in-law, Mae Schlossberg. Additional stories, many shared here for the first time, illuminate the rest of the Kennedy dynasty: Kara Kennedy, Ted’s daughter, and her valiant battle against lung cancer; how Ted’s wife, Vicki, introduced a new era of feminism to the Kennedy family; the lifelong struggles with addiction faced by Bobby Kennedy Jr. and Patrick Kennedy; the unexpected way pop star Taylor Swift helped Conor Kennedy heal after the death of his mother, Bobby’s wife Mary; and Congressman Joe Kennedy III’s rise to prominence. At the center of it all is the family’s indomitable matriarch, Ethel Kennedy—a formidable presence with her maddening eccentricities and inspiring courage. 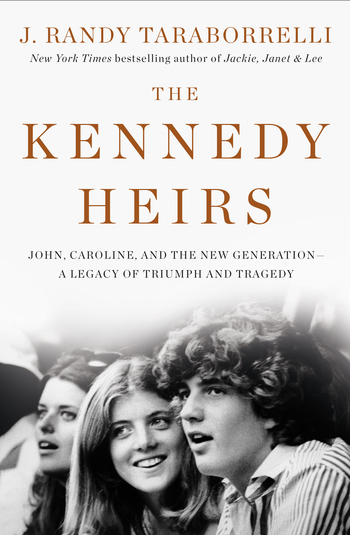 Based on hundreds of exclusive first-hand interviews and cultivated over twenty years of research—including numerous Oral Histories from the JFK Library and the Edward M. Kennedy Institute—The Kennedy Heirs is an epic drama of ambition, scandal, pride and power. “In this revealing biography, Taraborrelli explores the complicated relationship between Jacqueline Bouvier Kennedy Onassis, her mother Janet Lee Auchincloss, and her sister, Princess Lee Radziwill. Though the two sisters became two of the most idolized women of the 20th century, they struggled with sibling jealousy and constantly sought 'money and power'—which their mother told them was 'the secret to happily-ever-after. '” —People magazine, "Best Books About the Kennedy Family"
J. RANDY TARABORRELLI is the author of 20 biographies, most of which have become New York Times bestsellers, including: Jackie, Ethel, Joan: Women of Camelot; After Camelot: A Personal History of the Kennedy Family 1968 to the Present, which was adapted as a mini-series for Reelz; and Jackie, Janet & Lee: The Secret Lives of Janet Auchincloss and Her Daughters, Jacqueline Kennedy Onassis and Lee Radziwill, currently being adapted as a television series by Tomorrow Studios.